When you are young and financially independent, saving and investing for the future is barely a priority. Young people often make the mistake of thinking that they cannot save because they do not earn or have enough money to put aside. The other misconception they suffer from is that they are “too young” to save and time is on their side. If you too are harbouring similar impressions, we hate to break it to you that you are not far away from the truth! Firstly, you are never too young to save, and secondly, you can still begin your investment journey with a very little amount. The first and foremost thing to do is chalk out a financial plan with your financial goals and ambitions in mind. Consider your risk profile or your ability to tolerate losses. Further, consider financial ambitions at various stages in life. Your financial plan must serve as a roadmap for lifelong investments. You may need to make changes if there are alterations in your financial goals, but largely sticking with the plan will ensure success in the long run. As intimidating as it may sound, you don’t need to begin your investment journey with a fortune. All you need to do is find the right products and start small. Another cardinal mistake that youngsters tend to make is neglect of insurance needs. The first step in your investment journey should be towards safeguarding financial needs in times of medical emergency and taking care of your family’s financial needs in case of your death. Thus, insurance is the very first thing to consider as a beginner. Contrary to perception life insurance and health insurance does not burn a hole in your pocket especially when you are young. Plans that come replete with riders that range from pregnancy-related expenses to critical illness; you can be insured for a small annual premium. To begin with, it is wise to opt for online term plans that are substantially cheap (monthly premium can be as low as Rs 300) and available easily online. Another misconception that youngsters need to dispel is that a lot of money is needed to begin investing in capital markets. Equities as an asset class are known to offer the best inflation-adjusted returns over the longer period. Investing in equities can seem complicated to a young person. You can, however, benefit from professional fund management if you opt to invest in equity-oriented mutual funds. 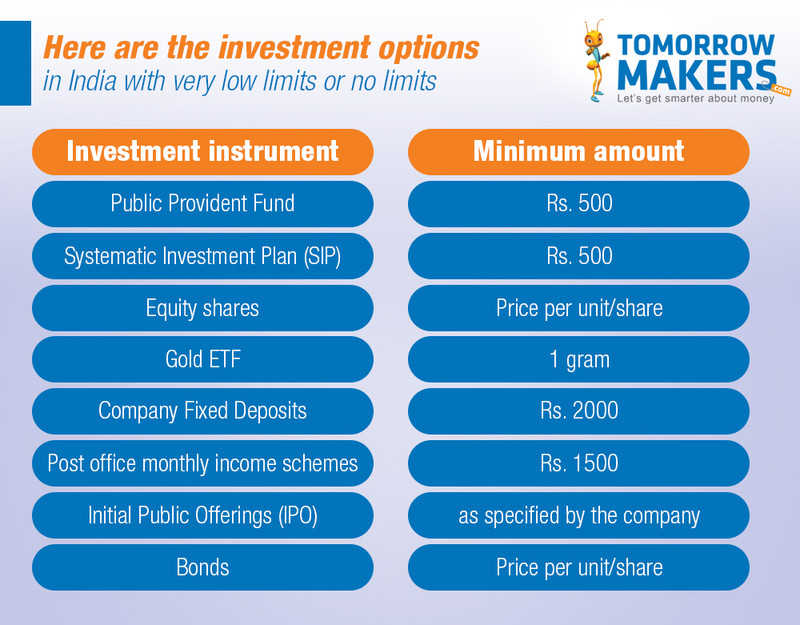 Unlike popular perception, you do not require a lot of money to invest in equity funds. If you are a young individual who has just attained financial independence, your foremost concern is likely to be tax incidence. Investing wisely can help you keep your tax liabilities to a minimum. Section 80C: While there are a variety of tax saving instruments that allows you to save tax under Section 80 C of the Income Tax Act, you need not necessarily opt for instruments that lock in your corpus for a period of 15 years owing to their popularity. ELSS: As a young investor, seeking to invest with the objective of saving taxes, you can opt for equity-linked savings schemes (ELSS) schemes instead, that are essentially diversified equity mutual fund schemes. ELSS schemes qualify for tax exemption under Section 80C of the Income Tax Act up to a limit of Rs. 1.5 lakhs in a year and have a lock-in period of only 3 years that is the lowest among all other tax savings instrument. 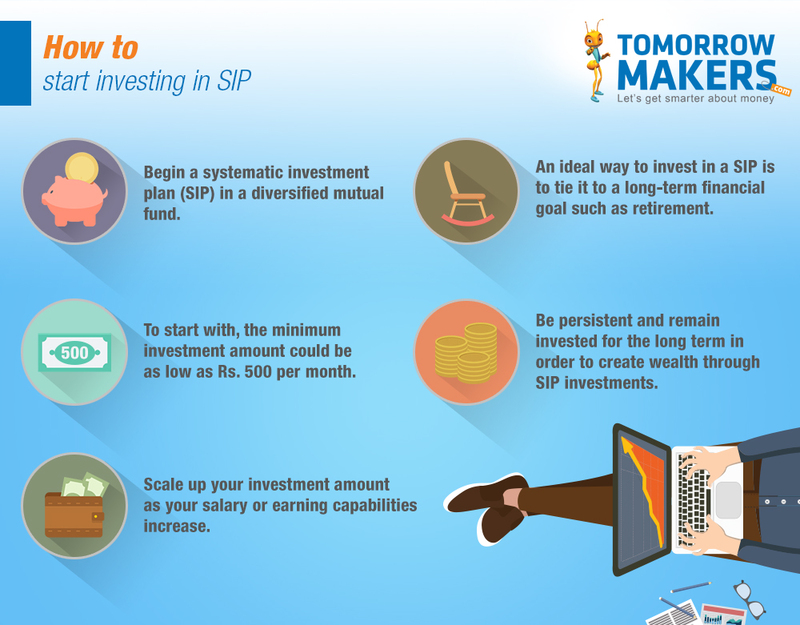 SIP: Besides, like any other mutual fund scheme you can opt for a SIP option in such schemes and gain from capital appreciation. That way, you can save taxes without burning a hole in your pocket, as well as benefit from capital appreciation. If none of the above options seems plausible to you because you are broke or are barely making ends, start with a loan from your parents. Instead of letting the money sitting idle in their bank account, show them that you are serious about finances, by investing it wisely. A set up a systematic transfer plan (STP) instruction to an equity fund. Investing is all about taking charge of your finances and moving in accordance with a financial plan. Taking your financial future into your own hands will give you a sense of confidence and security and help and ultimately result in a more comfortable life over the long run. So, even if you think that you do not have the money right now, let it not deter you from taking charge of your financial future.